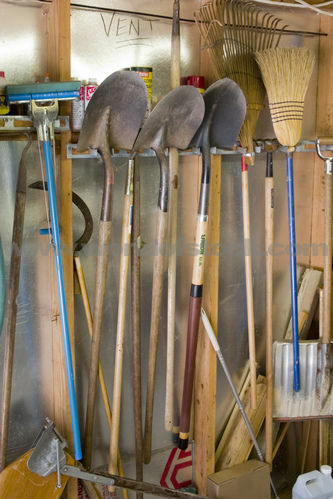 Your garage is likely one of the most used areas by everyone in your home. It also tends to be one of the most unorganized areas, too. This is a bad combo! After a long days work, as your garage door raises to welcome you home is there order or chaos? 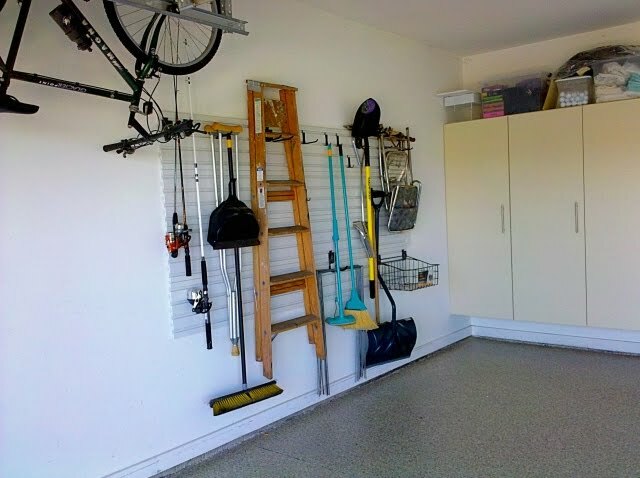 Sure your garage is a great big, open space to store a ton of stuff. Ideally, though ... your car is suppose to fit inside and you are not suppose to be climbing over boxes and bins to reach the door to your home. Think about using your walls to get organized. There is the tried and true nails-into-studs system for hanging items onto your walls. You can go a step and use the peg board system which gives you more flexibility. Or, you can use fancy, smanchy wall track system like Gladiator has called GearWall. 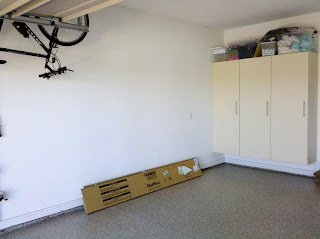 Here's the garage area before the installation began. The only tools needed are a drill or power screw driver, level and a stud finder. First I marked the walls for the location of the studs, then marked a level line (horizontal) as a guide for the lowest panel. Once the first panel was up, it was a matter of stacking the panels up on each other and securing to the wall. Once the 4 panels were in place, the hooks and baskets for the GearWall were brought in. With this wall system, you can buy a variety of accessories to fit your needs. The great part is everything slides around and easily moved as your storage needs change. The wall system holds up to 50 lbs per square foot which is nearly the weight of a bag of sand ... not that I'm not sure why you would store sand on your wall, but it's for comparison. Gladiator offers all sorts of hooks, baskets, bins and shelves for your organizing needs. This GearWall system went up like a charm. Seriously, if you can hang a picture, you can install this product. It is a bit of a pricier system, but the clean look and versatility in organizing options make this garage organizing system a winner and definitely worth the investment. Besides, if you can eliminate a point of chaos in your life, you should go for it. How does your garage make you feel? Your Kid is in College. You Need New Containers. As we were organizing "Janis's" attic storage, she came across this list. We had a bit of a chuckle and she suggested I share this with you. 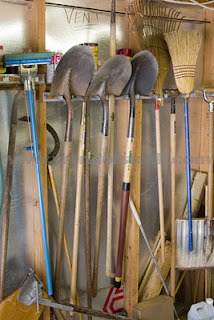 Overtime Janis's home became overwhelmed with stuff, or junk as referred to on her checklist. 1. Pick up our junk - A very good start, don't you think? Leaving items lying around for you to grumble as you walk past does not lend itself to help in the happy harmony of your home. 2. Put our junk upstairs - OK, this is alright though just putting item upstairs could be where this list begins to stumble. You want to put your "junk" back in its home. If you are keeping an item, the item needs to have a positive purpose in your life and it needs its own home or place to live in your home. 3. Clear our tables - Another good start. Tables and other nice flat surfaces are perfect places to set your "junk." Tables are also great places for your stuff to begin to pile upwards ... this is not such a great thing. Work to keep your flat surfaces clear by putting your items away in their home after you are done using them. 4. Do any other little think you can do - Uh oh. This will tend to lead your family to do whatever they wish, which will be the easiest, fastest path to nothing. Hey, if you gave me the opportunity to do anything I could think of ... whoa, I'm lying on my hammock to take an afternoon siesta ... zzzz... You have to give direction to what you wish to have action taken or you will end up with your teenage kid sleeping, eating, texting ... repeat. 5. DON'T YELL!!! - My personal favorite, even blogged about screaming. 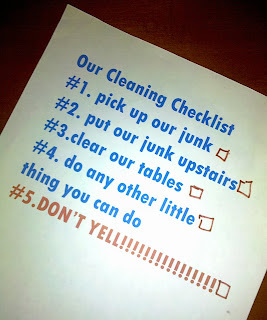 Yelling has it's time and place, though in the midst of your organizing project ... maybe not so much. Getting organized can be a big task and staying organized is a daily battle (even for me the professional organizer and don't let other organizers kid you. They struggle too). Take your time. Remember you will be far more successful breaking down your big organizing projects into smaller ones. Janis thank you for sharing your family's checklist with us. You are doing a fabulous job at getting organized and staying organized. What is your organizing checklist? Look around your desk, how does it look? Perhaps a better question: How does it feel? You know, calm and ready for action today or ugh, overwelmed, why bother, I need a coffee. 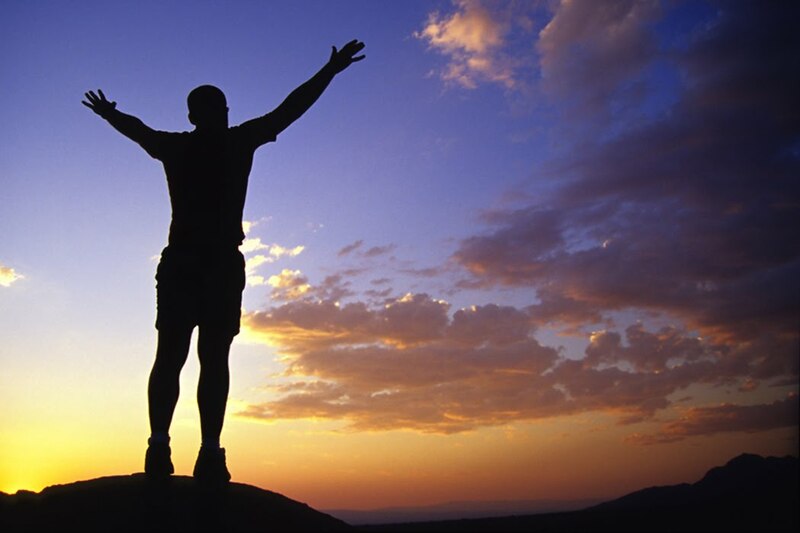 Getting you on the organized path starts with your first step. Choose 3 items and make a decision, Keep or Trash. If your keeping, put it away. Trash ... well, you know. Bah-bye! Repeat as frequently as needed for happy feelings. What did you put away today? What beast in your home needs to be tackled?